RUST has employed a new Anti-Cheat system that completely blocks Xpadder now so this profile will no longer function. 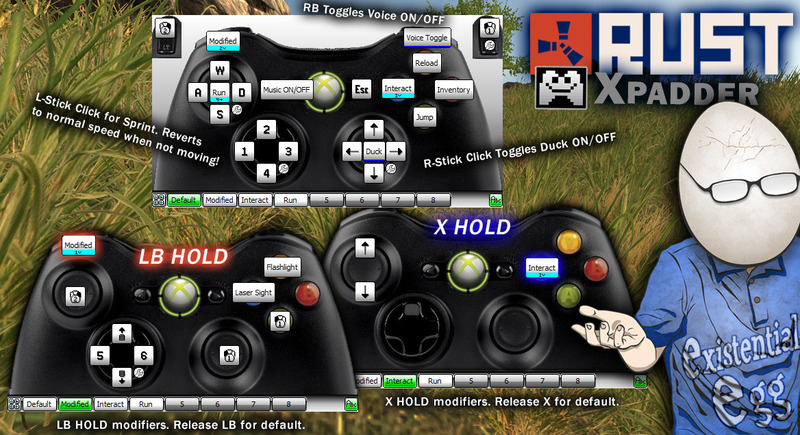 It may change at some point but I sort of doubt they will ever whitelist Xpadder since they are making their own controller support in-game. I made some hefty revisions to this profile. The below code replaces my previous profile. Lots of tweaks, true sprint click run (goes to normal W when you stop moving). Last edited by ExistentialEgg on 17 Oct 2014, 15:35, edited 6 times in total. Thanks a bunch this is awesome! If we cross paths in-game, I will beat you to death with my rock to show my gratitude. nabrendan wrote: If we cross paths in-game, I will beat you to death with my rock to show my gratitude. Hah. It would be an honor and a privilege to be beaten to death by someone who was using my profile! Thanks a mill. Gona give it a go now. made some major revisions. New details up top. Can anyone tell me how do I copy this into xpadder and make it work. for some reason the sprint doesn't seem to be working for me, any tips? When you release the stick button, your character should start sprinting when you push the left stick forward. You stop sprinting by releasing left stick forward. As long as you hold the left stick button, sprinting won't work. How do I get the image file to show up? if you mean the controller image that is in the thread for controllers. I currently use a different one than what is in that picture up top. Yeah... I can't help you. It's the new Anti Cheat system Rust is using. It COMPLETELY blocks Xpadder now. Looks like this profile will officially be dead. Sorry. I know they are planning controller support at some point but who knows how long we'll have to wait. I can't do anything about it. You'd have to lodge a complaint on the official Rust forums about their anti cheat system blocking xpadder.